Lightberry HD Review | Chewie.co.uk - Now with 100% less Wookiee! How we watch and use our TV has changed so much. I still remember the time of VHS and being grateful that I could even watch my favourite films at home. Now technology has advanced so far that watching a film at home can be more immersive than going to the cinema. Ambient light TVs are one of the latest technological advances for your television creating the illusion that the light from the screen carries on beyond the edges of the TV. Lightberry HD allows any TV to have this technology using a HDMI cable. The first thing to say is that the Lightberry really enhances the viewing experience. I ran the kit off of my Sony Bravia 55” TV and was amazed at the results. It is a really immersive way to watch films adding extra atmosphere. I tried the kit out with several genres of films and it worked well for all of them. I suggest the first film you try it out on is an effects heavy film such as Star War as you really notice the difference. 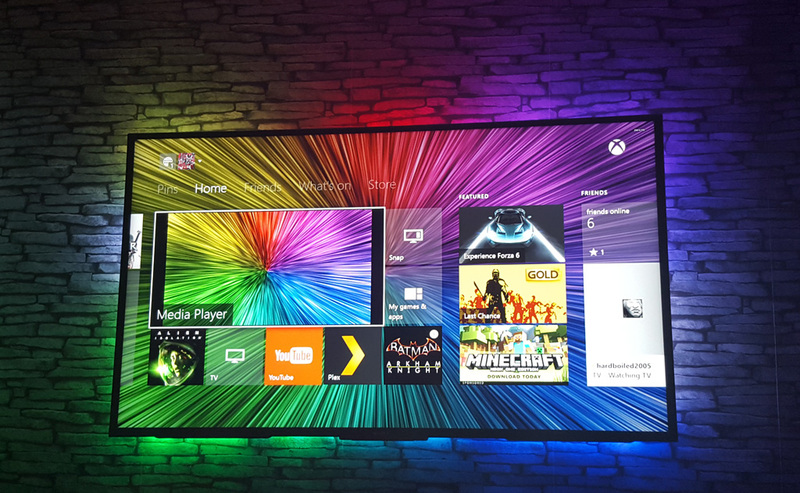 I also tried the Lightberry HD out with my PlayStation 4 and it was just as good if not better than the films. I think this is because games have less cut scenes so the changing light seemed a lot smoother. The only downside to the Lightberry is the setup. The official site states that Lightberry HD is easy to install and configure, yet it took me over an hour and several attempts to get everything sorted. You are going to need to fiddle around with the setup options to get everything perfect and this does require quite a bit of trial and error. Thankfully, I have written an in depth Lightberry HD buyers/setup guide that covers everything you need to get setup and configured quickly. Overall this will revolutionize how you enjoy watch films, and play games. I recommend this product for anyone looking upgrade their TV without buying a new Ambient TV. The only downside is that despite being promoted as easy to install it is, at times, complicated and you need a little technical know how and a decent amount of patience to get it perfect. 4 out of 5 Stars for this product. Hey Chewie! Thanks for this very detailed guide! I am planning to buy a lightberry as my freind has an ambilght TV and it looks awesome. I only want my XBOX ONE to work with it. Does this mean that I don’t have to buy the bundle? Only this one (https://lightberry.eu/shop/shop/lightberry-hd/) and a Raspberry PI?